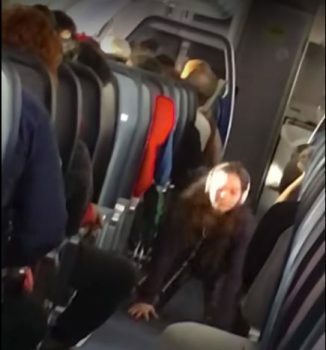 The internet seems to be pointing its moral outrage this week at a woman on a plane who was captured on video doing yoga <<gasp!>> in the aisle on a plane. Another passenger took a video of the “incident” and it has gone viral, raising a discussion about what kind of behavior is appropriate on an airplane. I tend to side with the intrepid yogi in this case. Although I might not be brave enough to plop down in the aisle and do downward dog or a camel pose (as this woman did,) I will often leave my seat and quietly find a pocket of space to do a few stretches. I try my best to ignore the awkward stares of other passengers or the annoyed flight attendants who have to move around through the cabin, because I know my body does not like sitting for too long and my spine will thank me for it later. But society, it seems, is not ready for this. We are taught, from a very early age, to spend our lives obediently sitting, first in classrooms, then in front of computers, and occasionally on airplanes. But a growing body of evidence seems to show that this is horrible for our health. And given that the ever accelerating rise of technology is also associated with an increase in sedentary lifestyle, maybe we should be working to change society rather than conforming to it. For me, this yogi is the heroine in the story. By defiantly doing her yoga in the airplane aisle, she shows what it looks like to hold personal wellbeing sacred, refusing to sacrifice it for some arbitrary cultural or corporate norm. She was probably the kid who couldn’t sit still in her class or the graduate who chose an alternative career to avoid being chained to a desk in a cubicle all day. More power to her. Maybe, she will even inspire others to do the same and this will become a growing trend, with more people taking to the aisle to get their sun salutations in mid-flight. If enough people do this, airlines will be forced to create a space for passengers to do yoga on every flight. I say let the revolution begin. Namaste.